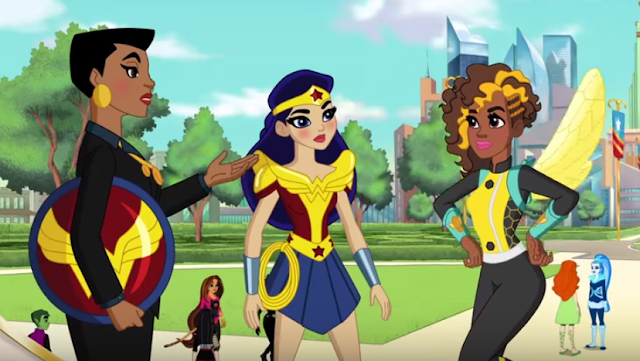 'DC Super Hero Girls' Animated Episodes Have Arrived! 'DC Super Hero Girls' made a splash at the New York Comic Con with the debut of toys designed for young girls and now animated episodes have been released as well. These short but sweet videos offers an alternate look at DC heroes and villains as teenagers attending Super Hero High. Wonder Woman arrives and is welcomed by Principal Amanda Weller and shown around by Bumblebee. It's an endearing and charming look at younger versions of famous DC Comics characters aimed at kids 6-12. It’s the start of a brand new year at Super Hero High School!!! Follow your favorite DC Super Hero Girls as they experience the ups, downs and all arounds on their first day of school. Every Super Hero needs a theme song. This catchy beat will get you PUMPED to get your cape on and save the day!